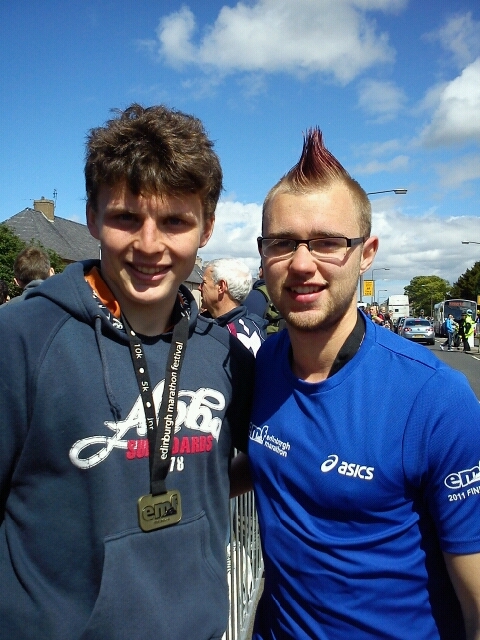 James Moreland (in photo on right with friend) ran the Edinburgh Marathon in May 2011. At the age of 18 years, 1 day and 20 hours, he became the youngest person ever to have run the Edinburgh Marathon. Below is his story of about why he decided to do it and the trials and triumphs along the way. Last November while sitting in a Saint Andrews pub on the east coast of Scotland, my friend and I made a deal to run the May 2011 Edinburgh Marathon together. Now, my friend was a runner; I was not. I kept myself reasonably fit—a 30 minute jog around St. Andrews would be more than sufficient for me—but forget about a gruelling 26.2 mile (42.1 km) annihilation around the Scottish capital! I first heard about Hands at Work through my mum Judith who travelled to South Africa to witness the work out there. Seeing her return really compelled to help was actually quite infectious, and after reading through the Hands at Work webpage, I too came to really respect the work that is being done. To me it felt like a perfect demonstration of Christians showing others–especially the poor and needy–God’s love and compassion for them, putting into practise one of the two commandments Jesus highlighted: love your neighbour as yourself. It’s a brilliant display of Christian ‘brotherhood’ as people come together—local churches offering love and support and oversees volunteers using their giftings to serve. I can’t emphasize enough how inspired I was by Hands at Work and I found God really challenging me to give and serve more, which is ultimately why I felt running the marathon to raise money for Hands at Work was a perfect opportunity to support the work. So I would run the marathon for Hands at Work, and I would do it in less than 4 hours. Once the applications were through we started training right away. Sadly, two weeks in I injured my knee quite badly and had to give up training for a while. The break was longer than expected, but two months, several trips to the physio and a few packets of painkillers later, I was able to get out running again. Progress was a lot slower than I initially hoped and by March it reached the point where it was practically impossible for me to complete the training required to finish a marathon. Against medical advice and better judgement, I decided to continue doing what little training I could and aimed to run the marathon anyway. But at this point my initial goal of beating four hours was long gone and I just accepted, that if I was going to finish the marathon at all, it was probably going to take me five, if not six, hours to complete. May arrived, and with only three weeks until the marathon, I still hadn’t run farther than 7 miles (11 km) – the distance at which my knee would just give out. My final training run before the race lasted only 4 miles (6.5 km) before my knee packed in and despair sank in. The next day I was reading about Elijah on Mount Carmel (2 Kings 18). In the final verses it recounts how Elijah had told Kind Ahab to leave his chariot before the rains came, when “the Lord’s power came upon Elijah and tucking his cloak into his belt he ran ahead of Ahab’s chariot all the way to Jezreel.” For the next 2 weeks my prayer was that on May 22nd the Lord’s power would fall on me too and I’d be able to run start to finish! The day of the marathon came. I had planned to interchangeably run and walk in the hope that my knee would last a little longer. As I approached the six mile marker, the first of my ‘stop and walk’ points, I felt pretty good and just pushed on. I kept running and mile markers seemed to pass at a decent rate ... 8 ... 10 ... 14 ... 17 ... and before I knew it I was at 19 miles (30 km) in only 2 hours 45 minutes – an hour before I’d expected to be there! From then on, it was seriously tough though: uphill, into the wind, and now feeling the pain of my tight calves and one of my toes that had swollen to the point that it popped leaving a visible blood stain on my trainers! Every step was rather painful and took a vast amount of effort. Going from ‘still feeling pretty good’ at 19 miles I’d deteriorated rapidly by the time I reached mile 21. I sent a text to a few Christians who said they’d pray for me during the race, fully expressing how much I hated it at that point, and got one immediate reply simply saying, “I’m praying, you can do it.” At that point a praise song (martyrs and thieves) came on my iPod. I can’t really remember much of the next three miles besides a lot of tears and a profound feeling that since God had gotten me this far, he’d get me to the end. And after plodding forward, the finish line eventually arrived in a time of 4 hours 15 minutes. I’m hoping that my last few painful miles, however small the sacrifice, will help relieve some of the suffering that vulnerable children face on a day to day basis in Africa. To date James has raised just over £130 and counting for Hands at Work in Africa.